Puketotara Once Bittern is one of a series of works featuring the cleared land around Kerikeri's Puketotara area - a location beloved by the artist. These works were exhibited at Peter McLeavey Gallery in 1976 alongside a series of eight entitled A Tree, of Many, One named after Wordsworth's poem Intimations of Mortality. A particularly striking point of difference about the paintings which were featured in this show is the elevated importance of landform as subject matter. This represented a shift in focus from Binney's earlier work, in which land and sky served as background elements and were secondary in status to the birds. While the Bittern in this work possesses the same elegance, the same promise of hope and soaring upwards movement as seen in many of his earlier paintings, the relationship with the land in its specific and identifiable form is now also of great importance. Puketotara Once Bittern was reported as the standout painting of this exhibition at Peter McLeavey Gallery, and singled out in an Evening Post review as one of the most beautiful of the paintings. 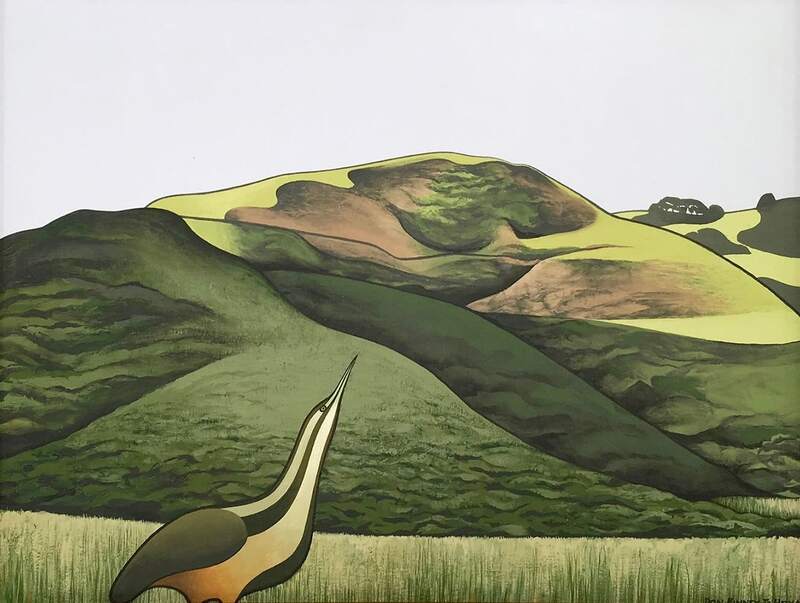 The work possesses a light and almost playful quality reflected in the title, as well as that of the accompanying work Puketotara, Twice Shy, which was purchased by the National Gallery and is now in the collection of Te Papa Tongarewa. Of the exhibition entitled A Single Field (Puketotara) Don Binney, arts commentator for Wellington's Evening Post, Diana Dekker wrote in March 1976: Peter McLeavey has hung his first exhibition for the year. It is of 14 recent paintings by Auckland artist Don Binney, eight on the theme of A Tree, of Many, one and six in a series on A Single Field (Puketotara… The Tree he looks at from all angles and in all lights and through winter and summer, is a big old pohutukawa at Te Henga. Cleared land on Puketotara is the subject for A Single Field (Puketotara). One of the most beautiful of the paintings is Puketotara Once Bittern, the study of a standing bird, graceful neck extended, merging in outline and colour into the lines of the landscape.